Rhett Reed and Molly Broughton have been chosen as the new Tom & Becky ambassadors for Hannibal, Missouri. 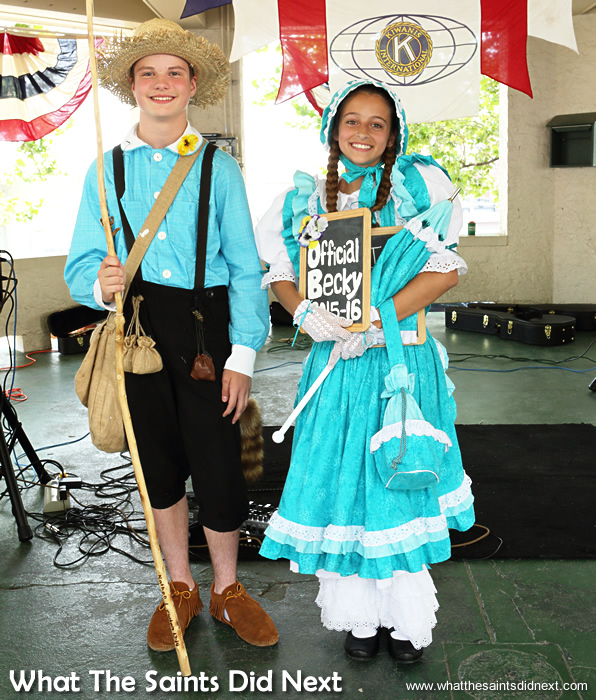 When American writer, Mark Twain, wrote a story about 12 year old Tom Sawyer’s adventures in a small Mississippi River town, he could never have predicted that 140 years later 7th grade Missouri students would travel the world bringing new life to his characters, Tom and Becky. It’s July 4th and Sharon and I are lucky enough to be here in Hannibal for the Independence Day celebrations. Along with a few hundred residents and tourists, we have just watched the final process of a competition that is now 60 years old. The five boys and five girls taking part are dressed in beautifully made, 1876 period costumes. 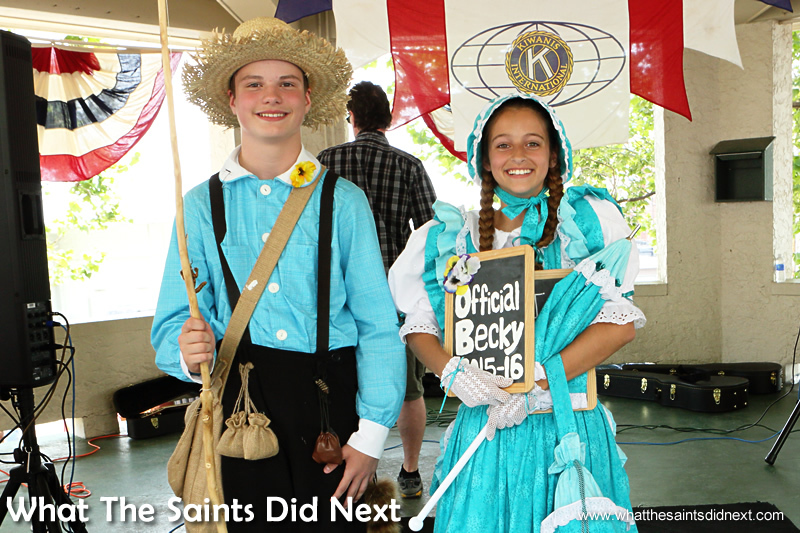 Every year a ‘Tom’ and a ‘Becky’ are chosen from around 60 young hopefuls, to represent the famous fictional characters; the mischievous Tom Sawyer and his childhood sweetheart, Becky Thatcher. Rhett Reed and Molly Broughton, both 13, have just been announced as the new Tom and Becky. 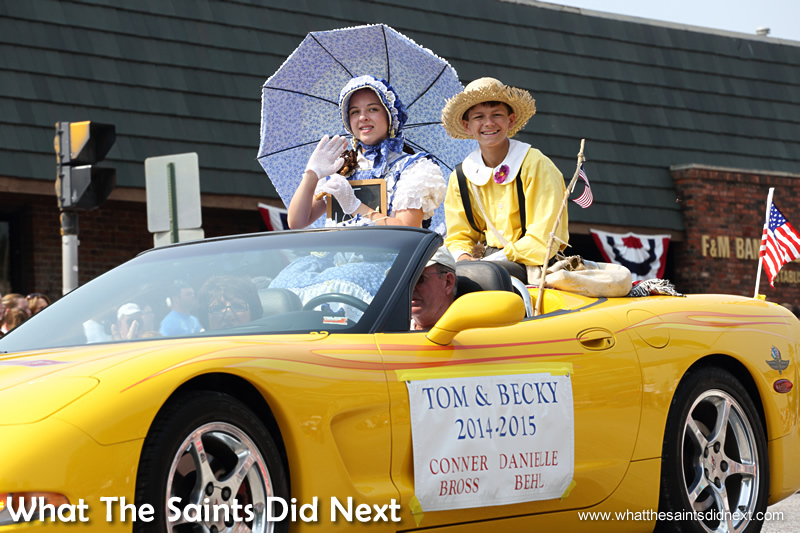 Two of last years alternate Tom and Becky pairings taking part in the July 4th parade in Hannibal. Growing up in a small island myself, the occasion has a small community familiarity that I recognise well and makes me smile. Each contestant’s introduction included the names of their parents; the obligatory thank you list in each speech; the pockets of family and friends cheering as each youngster took the stage. This is so much like St Helena, even though I’m in the middle of the USA. But this is more than just a small town, feel good, pageant. Mark Twain’s (real name Samuel L. Clemens) boyhood home town of Hannibal, Missouri, on the banks of the Mississippi, is taking full advantage of their heritage to offer incredible opportunities for boys and girls in the community. 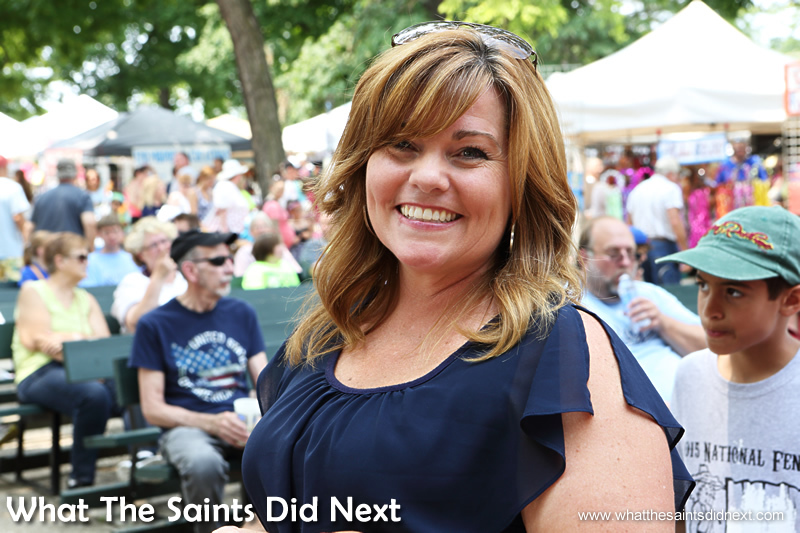 “It’s a big honour here in Hannibal, Missouri,” I’m told by a positively beaming, Melissa Cummins, this year’s event coordinator. Melissa Cummins, 2015 Tom & Becky Coordinator at the Mark Twain Boyhood Home and Museum. The Tom and Becky program was created in 1956 by the Hannibal Chamber of Commerce, a reaction to the 2,000 or so students visiting each year from nearby St Louis. The Chamber thought a Tom and Becky greeting the students as they arrived would be a good idea. Originally there was just one Tom and Becky, but “requests for appearances kept growing so now four alternate couples are [now] also chosen who make appearances all year,” said Melissa. Selection takes six months, beginning with registration in February and the winners being announced on the Fourth of July. The candidates, “all 7th grade students from the Hannibal school district” undergo intense assessment and scrutiny, including giving speeches, a written test that involves answering 108 questions and different interviews. Rhett and Molly, 2015 Tom and Becky winners, undertaking one of their first official duties, judging the July 4th Fence Painting competition. In March the field is whittled down to 12 boys and 12 girls, then later this is reduced to the five boys and five girls who at that point are all confirmed Tom and Beckys. More testing, a two day orientation process in June and interviews then follow. 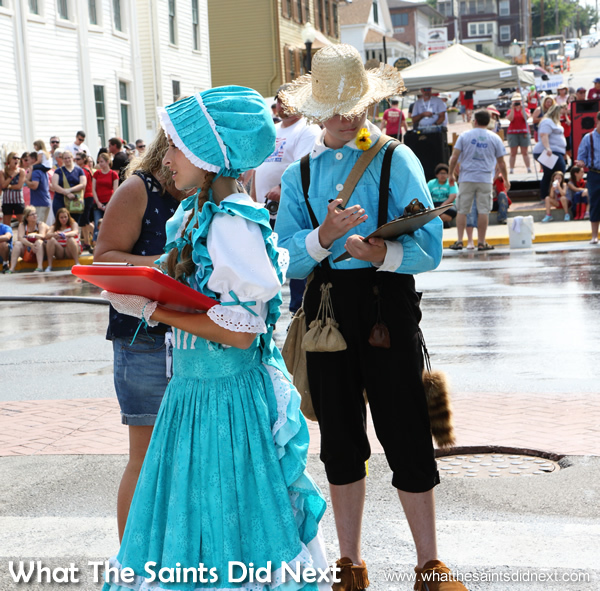 Judging takes into account the candidates’ knowledge of Hannibal, Mark Twain history and their ability to interact and engage with visitors to the famous town. Once selected, the five pairs become ambassadors for Hannibal and carry out “anywhere between 200 and 300 appearances” over the course of the year. Rhett and Molly’s costumes were superb. Now that the Missouri media have finished talking to the new Tom and Becky I move in for a quick word. The two are extremely polite and definitely engaging, confirming what Melissa has just said. It’s noticeable both youngsters seem unfazed by the attention, but I guess after six months preparation this is a piece of cake! During my chat with Melissa she mentioned the bags that the Beckys carry, all contain unique items chosen by the girls, each with their own story and that I should ask to see inside one. Thankfully I have Sharon on hand so my request to look inside a young girl’s handbag doesn’t appear too weird. Lillie Ford is nearby, one of the outgoing Beckys from 2014. She happily retrieves the items from her bag, one by one. 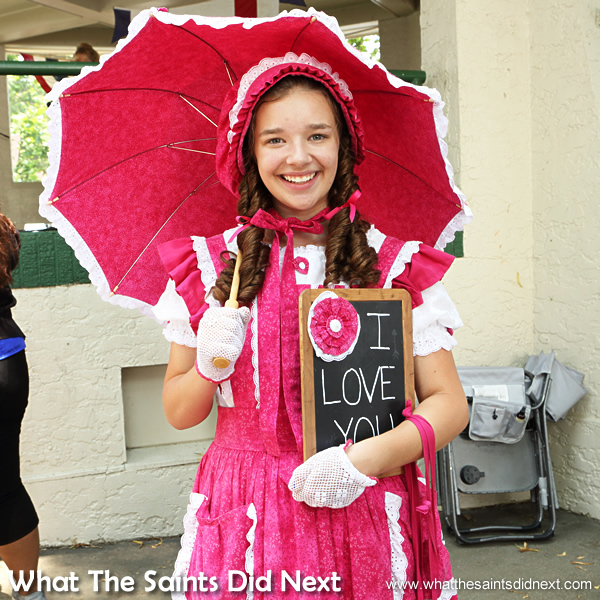 “These are things that Becky would have had when she lived in that time period,” explains Lillie. Lillie Ford, one of the outgoing, alternate Beckys. They include an Award of Merit badge for best penmanship and an ink well to go with it. Lillie’s bag also contains a tiny perfume bottle, a little holder for sewing needles, a strip of knit lace and a doll made out of corn husks. 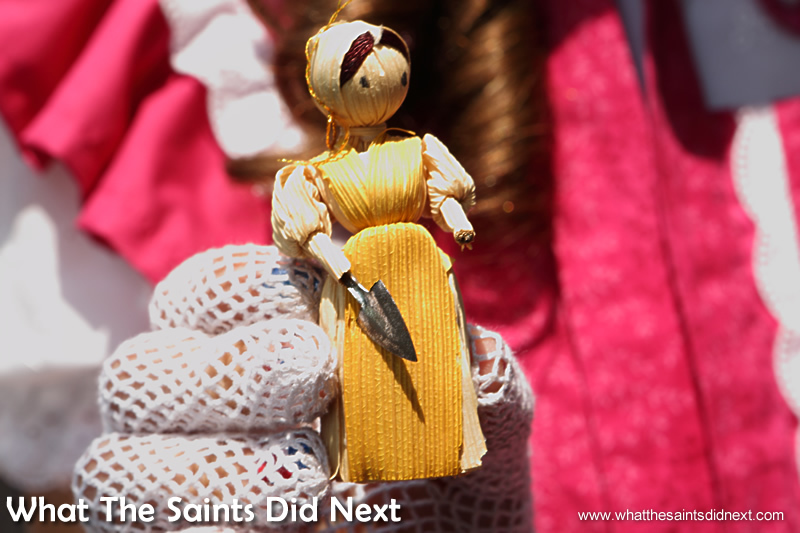 The corn husk doll in Lillie’s hand bag, typical of a toy Becky might have carried in 1876. It’s been inspiring learning about the Tom and Beckys of Hannibal. Organiser Melissa told me the programme doesn’t stop after the ambassador year is complete. In the following year, former Tom and Beckys (all five pairs) are encouraged to continue excelling in both academics and extra curricular activities in the community. This makes them eligible to apply for the two college scholarships when they come of age.